Following widespread community consultation throughout Central Otago participation by youth in the arts was identified as a key need. The Central Otago District Arts Trust developed a Youth Charter. Young people are creative and the Youth Charter gives them an outlet for their creative needs. The Charter seeks to encourage collaboration between community, schools, parents, teachers and other art educators to provide access to art experiences for young people.The unveiling of four major murals marks a milestone in the provision of opportunities for children to participate in and present their creative experiences. Ten students from Alexandra Primary painted 'Rail Trail Bird Girl' to decorate the public toilets in the Alexandra Brandon St car park. Ten students from Terrace Primary painted 'Aliens Beam up a Cow' to decorate the Alexandra BMX park public toilets. Eight students from Clyde Primary painted 'Four Seasons in Central Otago' to decorate the Clyde Railway Station public toilets and ten students from St Gerard's created 'Camo Deer' for the Molyneux Park toilet block. For each of these murals students were guided through a series of workshops based around the design and creation of a public art piece. Students then painted their designs onto 4 ply panels during the week long 'Thyme Festival'. The general public were invited to come along and help with the painting each afternoon. The completed images were then reproduced onto exterior grade panels and subsequently hung throughout Alexandra and Clyde. 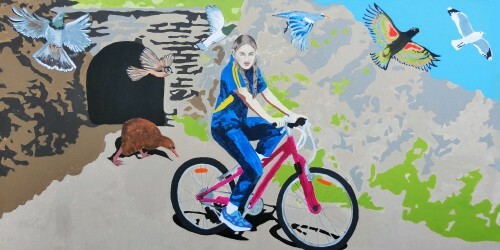 Following discussions between the Arts Trust Coordinator and the Central Otago District Council the Youth Mural Project was seen as a way of beautifying public spaces and further engaging young people of Alexandra and Clyde in the arts.